This week is about finishing. "Back to the Garden" is faced and has its label and sleeve. P's "Hunter's Star" is just about finished. 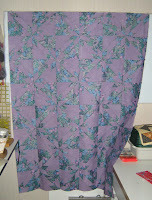 Today it gets its border and maybe its quilt design; by the end of the day tomorrow it will be sandwiched and basted. In the photo at left there are 6 blocks across and 8 down. However, as of last evening, there are 7 blocks across and 8 down. 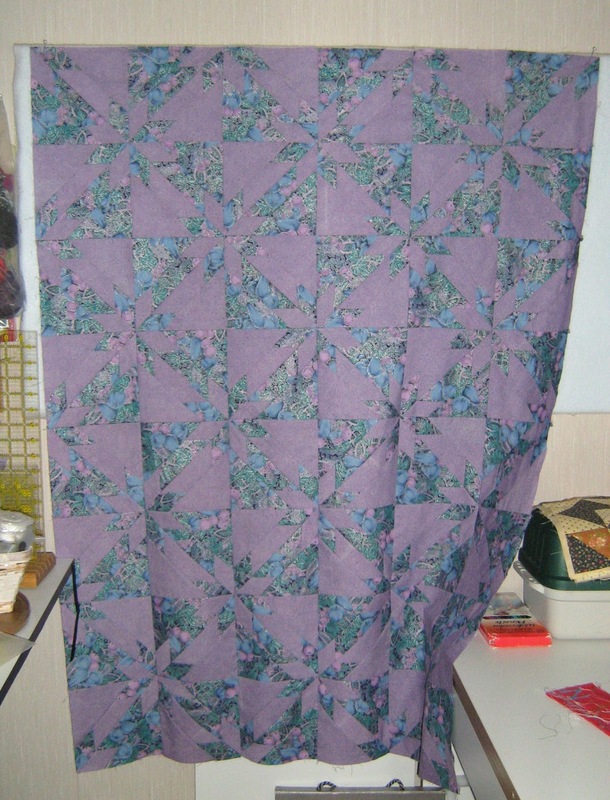 Each block is 6" finished, so that's 42" wide by 48" long. However, there will be a narrow border -- 1 1/2" finished -- all the way 'round, in the blue print fabric, and binding to match, bringing the finished size to 45" wide by 51" long. Deadline: June 22, when I fly to Montreal! And yesterday I delivered "My Little Choia Garden" to Patti Morris, the SAQA Western Canada Co-Rep for Alberta, who's curating our next travelling exhibit, The Burgess Shale Project. This is a show of a different sort! 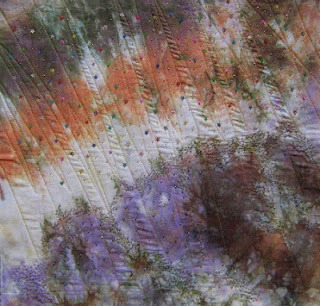 Instead of quilt shows and galleries -- at least initially -- this two-dozen-piece exhibit will be travelling throughout Alberta elementary schools, fusing art and science, to teach kids about the Burgess Shale Fossils -- with colourful textile interpretations. I hinted at this piece while it was under construction, but now I feel I can share it. The pieces are gathering at Patti's home in Red Deer, soon to be picked up the by the curator from the TREX program, which is hosting the province-wide school tour. TREX is run by the Alberta Foundation for the Arts; we linked into it through one of our PAM members, Barbara J. West, A.S.A. There will be cards and a book published as part of the project -- and the exhibit should be travelling for at least two years. It's our fond hope that other parts of the SAQA Western Canada Region will then be able to tap into it and move it through schools in B.C., Saskatchewan and Manitoba. To make a pretty garden. Materials: commercial cotton and batik fabric, cotton thread, polyester thread, recycled woven blanket of unknown origin, DMC © #5-wt perle cotton, poly-cotton batting. 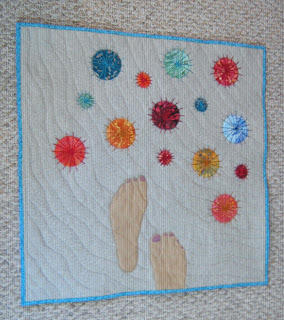 Techniques: rough-edge appliqué, machine quilting, hand embroidery. · “Octopus’s Garden” – Richard Starkey (Ringo Starr), 1969 – recorded by The Beatles on their album, Abbey Road"
Once I know where the exhibit will be showing, I'll post the information in case anyone is nearby and wants to check it out. I've seen the other pieces Patti's collected so far and can safely say this show will be unlike any other! As for Starting...Self-directed Summer School resumes shortly...with dye, paint and ink studies first on the schedule. Stay tuned! I definitely want to know if this exhibit ever comes down to Southeast Saskatchewan. What an inspired project! Wonderful piece, Margaret! Congratulations! What an ingenious idea for venues great for kids to experience the art/science connection. I agree...its a wonderful piece and great project! I also enjoyed your poem! Well done!